A few of the gals in the trailerhood wanted me to teach them how to paint. They wanted to paint something bright and funky to liven up their beach trailers. Instead of the “normal” way of painting, we did things a little different. We started out painting intuitively, working the background with lots of layers of color, texture, and pattern…waiting for the octopus to find his way onto the canvas. We painted with our hands and with different size brushes, letting each layer dry in between. Once the layers were in place, we used a pattern to paint the water around the octopus and finished up by adding in the details. Even though we all used the same pattern, each octopus was a unique creature with its own personality! They now all hang proudly in the trailer homes of the artists. During the “official octopus tour” the artists invited us into their homes to show off their creations on display. One artist even told me that I had inspired her to get out her paints and long-forgotten brushes and make art again! That is what it’s all about! We are planning on a turtle painting party in the fall. 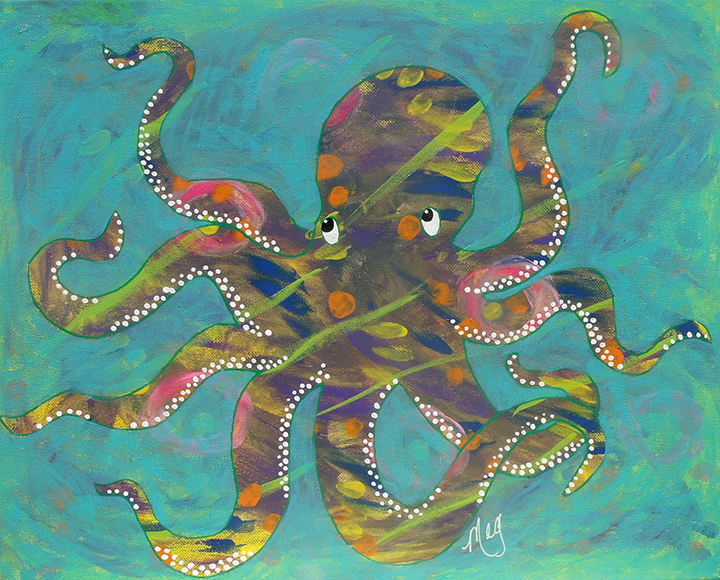 This entry was posted in Uncategorized and tagged beach, octopus, painting by Sandy Lupton. Bookmark the permalink. Awesomeness!!! You are a artsy ROCK STAR!!! Wish I could have been there having fun with you. I wish you could have been there too! Remember those green frogs in the bath house? loveya.